There have been several recorded times in history when the sun has suddenly turned blue. The scientific explanation for them is even better than the legends people created to explain them long ago. 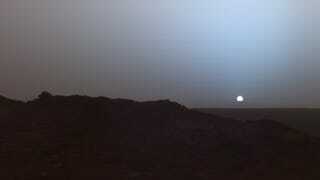 A blue sun allows you to see — briefly — what the skies are like on Mars. All right, not literally into Mars, but blue suns do happen under circumstances which recreate conditions in the Martian atmosphere. The yellow sun that we have isn't so much yellow as it is an ordinary white star whose light is filtered through our atmosphere. That atmosphere is made up of little particles that scatter blue light. Blue gets thrown around the sky, occasionally coming down to Earth, which is why the sky is that lovely blue color. As all the blue light gets filtered out of the rays of the sun the remaining light skews yellow. So when we look up at the sun itself, we see it as yellow. On Mars, the reverse happens. The atmosphere doesn't scatter much light because there isn't much atmosphere to be had. What atmosphere there is has picked up a lot of dust, and that flying dust scatters light. Because it's a great deal larger than the particles of air, it scatters longer wavelengths of light, and so red is filtered out instead of blue. Sometimes on Earth, when there are fires going, or in the wake of a dust-spewing volcano, there is enough red-scattering dust in the air to recreate the look of Mars. The atmosphere does scatter a lot of blue light, but not all blue light. Just enough so the sun looks slightly yellow. The dust so effectively takes care of the red light that what blue light does come down from the sun is the only light that can be seen clearly. The dust doesn't necessarily have to be all around the viewer. If the dust is far off toward the west or east, the sun can be behind it without the viewer necessarily noticing anything wrong - except the sun turning blue. Blue suns have caused alarm in many areas of the globe, but the most famous American consequence of a blue sun was Nat Turner's Rebellion in 1831, when Nat Turner and several other slaves rebelled in Virginia. The rebellion had been planned well beforehand, but it was said that the blue sun was seen as a starting signal. Scientists are split on exactly what turned the sun blue. Some think it was ash scattered through the air after an eruption from Mount St. Helens. Others have found records of wildfires in Virginia around the time of the rebellion, which would have kicked up dust into the air. The rebellion was ended after only a few days, but it remains a pivotal part of American history, tied in with an extraordinary optic phenomenon. Via IOP Science and Harvard.